Whether you’re jonesing for ski season to get here, you’re an avid cyclist or you’re cutting lawns this summer one things for sure, you’re most likely doing it with music. By now you’ve probably found the best pair of over the ear ear buds, and the music app you like the best. But no matter what music app you like or what headphones you’re using there’s still one problem. Every now and then you need to change the song, you want to hear the song again or you need to turn down the volume. In all three scenarios (skiing, biking and cutting the grass) you really don’t want to bother with pulling your phone out of your pocket. It’s inconvenient when you’re cutting the grass, and it can be downright dangerous when you’re skiing, or biking. GoGlove gives you hands free control of your music by actually using your hand. GoGlove is a lightweight, inner glove that has sensors in the fingers. The sensors are programmed to interact with the thumb of the person who’s wearing it. Your first finger can turn the volume up, the second can turn it down, the third can advance the song and so on and so forth. Really changing the song or the volume is as easy as snapping a finger. 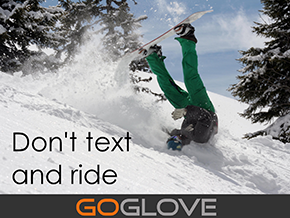 Using GoGlove means you never have to reach for your phone again. It’s truly about convenience and safety. Speaking of safety GoGlove is answering the call of early backers and developers everywhere. They plan on opening up an API soon so that anyone can create GoGlove apps. It could be a panic button (snap) app, games or a way to distribute email being read aloud. GoGlove can actually go further than gesture based controls.